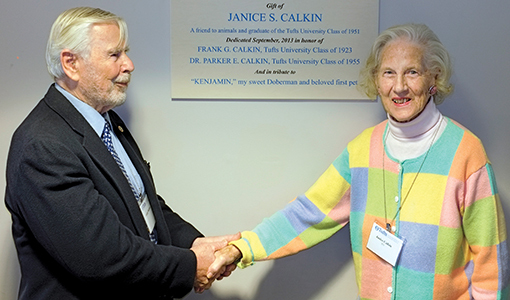 Janice Calkin, J51, is congratulated by her friend, George Shaddock, during the dedication of the lobby, which she funded, at the Tufts at Tech Community Veterinary Clinic. 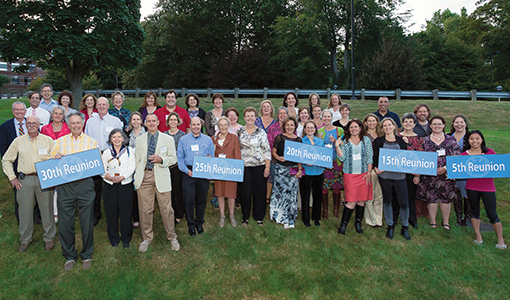 Alumni celebrated many milestones at this fall’s reunion: This year marks the 35th anniversary of the Cummings School of Veterinary Medicine, the 30th anniversary of the Tufts Wildlife Clinic and the school’s first 30th reunion, for the inaugural class of 1983. The reunion wasn’t all about nostalgia, though. It also increased support for the school and current students. Janet “JJ” Kovak McClaran, V98, a member of the school’s board of advisors, offered this challenge: For each reunion class that doubled its class giving participation rate, she pledged to create a single-year term scholarship, to be presented to a deserving student in the class’s name. Two classes, 2008 and 1993, had met the challenge by reunion weekend, doubling their number of donors over the previous year. The inaugural class of 1983 and McClaran’s own class of 1998 met the challenge shortly afterward. The class of 2008, the first to meet McClaran’s challenge, harnessed social media to motivate classmates. The challenge’s focus on financial aid made it particularly appealing, says Oura, a radiologist at Tufts Veterinary Emergency Treatment and Specialties (Tufts VETS) in Walpole, Mass., who lives in North Grafton with her husband, Sam Jennings, also a member of the class of 2008. The reunion featured a tour of the new Tufts at Tech Community Veterinary Clinic in Worcester, Mass., for which Greg Wolfus, V98, serves as director. A partnership between the Cummings School and Worcester Technical High School, the clinic offers subsidized care to pet owners who might otherwise be unable to afford it. 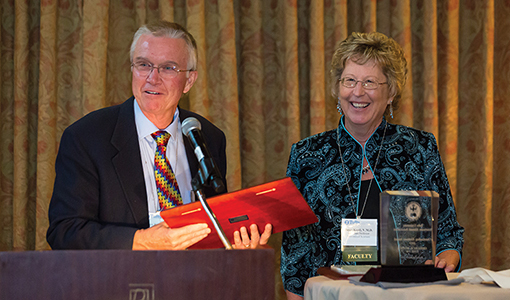 At the reunion, Wolfus received the Veterinary Alumni Association’s 2013 Outstanding Alumnus Award for his work at the clinic. The facility’s client and patient lobby, which was funded by a gift from Janice Calkin, J51, a Tufts undergraduate alumna, was dedicated during the tour. Calkin and guest George Shaddock came from Connecticut for the celebration. A continuing education session during the reunion weekend explored the causes, diagnosis and treatment of diseases carried by insects, such as mosquitoes and ticks. For alumni who remember the early days, the reunion weekend offered an opportunity to reflect on how far the school has come. Being a member of the inaugural class was an adventure, “exciting and scary at the same time,” says Mary Labato, V83, a veterinary nephrologist at the Foster Hospital for Small Animals and a clinical professor at the Cummings School. Labato remembers how one of her professors regularly stopped a large-animal lecture whenever the coffee truck arrived on campus so that everyone could go out and get something to drink. “There was no cafeteria. There wasn’t even a soda machine,” she says.